Welcome to the Forza Week in Review, and what a week it has been. Forza community writer Johniwanna filling in for Mechberg this week, after just getting back from a whirlwind trip to the Hoonigan Garage in Long Beach, California. A recap of that awesome experience, the latest detail drops from Forza Motorsport 7, your weekly #Forzathon review, and more in this edition. So, since this is a deep pool of Forza News, let’s dive right in. 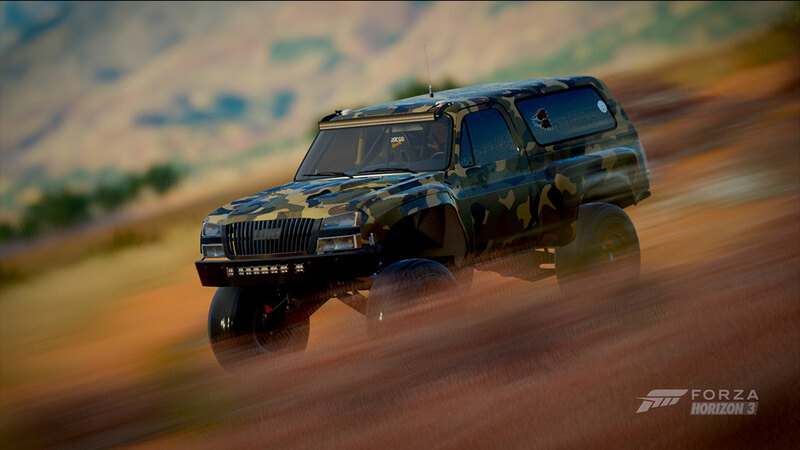 By now you have got to know about the Hoonigan Car Pack for Forza Horizon 3. This past Tuesday the car pack came out and we followed up shortly after with a killer livestream event on Mixer and Twitch. 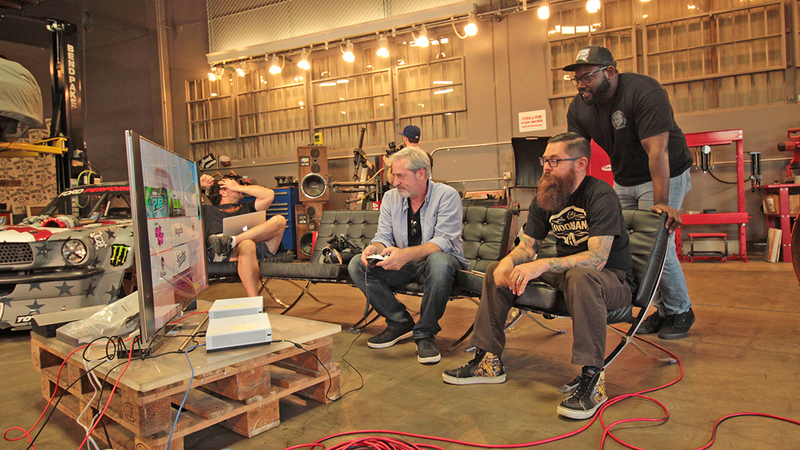 I got to play co-host along with Forza Horizon 3 design director Jon Knoles and a cast of Hoonigans, including Gymkhana video director Brian Scotto, as well as Hert, and Jon Chase from the Donut Garage. In case you missed the live event you can watch the replay on Twitch and Mixer. Don’t forget about that Hoonigan Car Pack trailer, either. So far, this bad boy has earned over one million views. 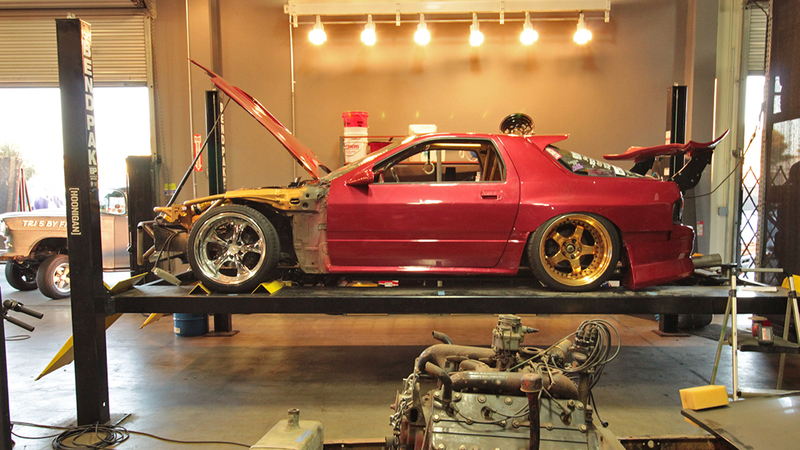 Let me tell you, spending time in Hoonigan Garage is like a Forza fantasy come to real life. Everywhere you look there are crazy car projects and just about every type of vehicle, from mini-bikes to golf carts that have all received some special treatment so the guys can abuse them in pursuit of a good time. There are bits of destroyed tires everywhere you look, and there isn’t a car there that doesn’t make awesome sounds, and hasn’t already proven its tire-shredding ability. Seeing the cars of the Hoonigan Car Pack in real life was a highlight but the whole place is amazing, as are the people. We hope you enjoyed the show, and don’t forget that you can get the car pack for free in Forza Horizon 3 today, and in Forza Motorsport 7 on day one if you pre order the digital version of Forza 7. 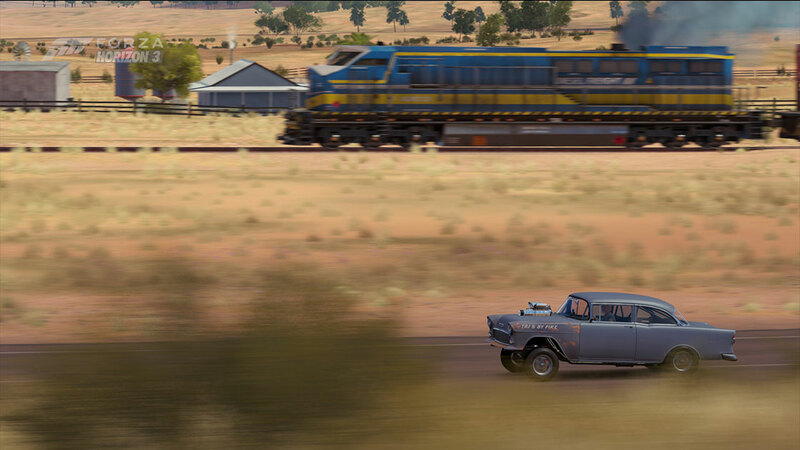 The Hoonigan Car Pack is also available as a standalone car pack for Forza Horizon 3. Here are a couple photos from behind the scenes. While the first two are obvious as to what they are, the third one may have you wondering. 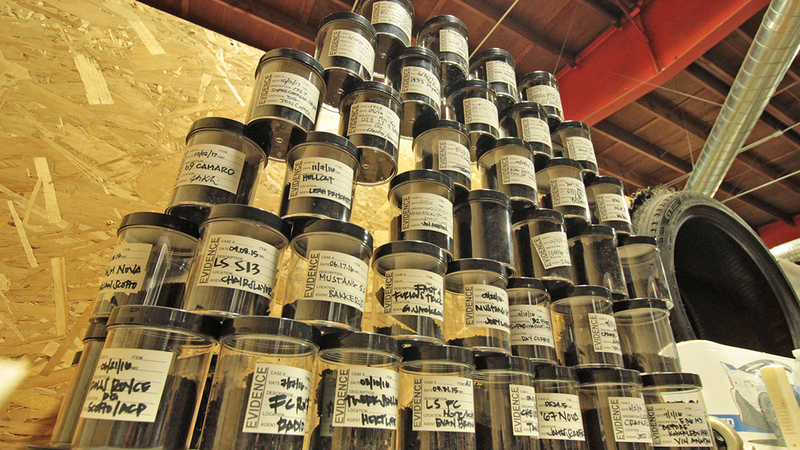 Those are evidence jars full of shredded tires from all the people that have done burnouts in the garage parking lot, which is smaller than you might think. Also, if you are not language sensitive, you can take a look at the Hoonigans Daily Transmission episode from Wednesday where they deliver their own version of a recap of the day. Now, let’s take a moment to hear from Mechberg about the big track announcements this week in Forza Motorsport 7. Earlier this week, the folks at ComputerBild published a feature on tracks in Forza Motorsport 7. 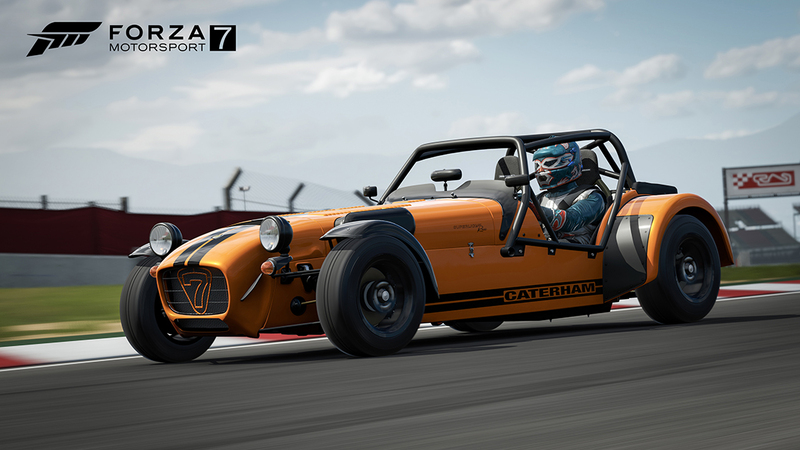 Featuring a discussion with Forza creative director Dan Greenawalt, the article pointed out the many cutting-edge techniques that Turn 10 uses not just to capture and recreate tracks with amazing accuracy, but also to bring them to life with new weather scenarios and alternate times of day that literally cast the tracks of Forza 7 in a brand new light. If you haven’t already done so, check out the article now. It’s one thing to read about the changes coming to tracks in Forza 7 but it’s a very different thing to see them for yourself. A quick peek at some of the screenshots here is a very good place to start. Suzuka is a prime example. 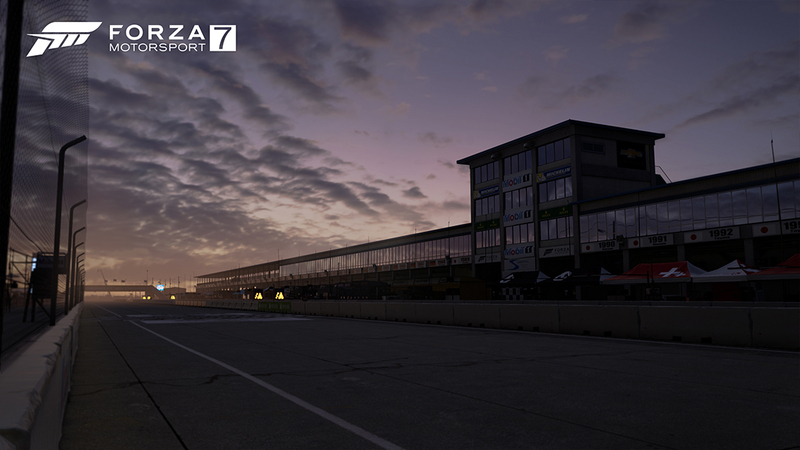 Like all of the real-world tracks in Forza Motorsport 7, Suzuka is officially licensed and completely rebuilt with HD assets designed to look fantastic on the entire family of Xbox consoles. Not only is the track completely rebuilt and updated, Suzuka also features wet weather conditions for the first time in Forza history. Imagine tackling the “S Curves” at full speed, or barreling around the harrowing 130R, only this time battling the dynamic puddles that line the edges of the circuit, and the blinding spray of the cars in front of you. The same challenge that real-world drivers face at Suzuka lap-after-lap, will now be your challenge as well. 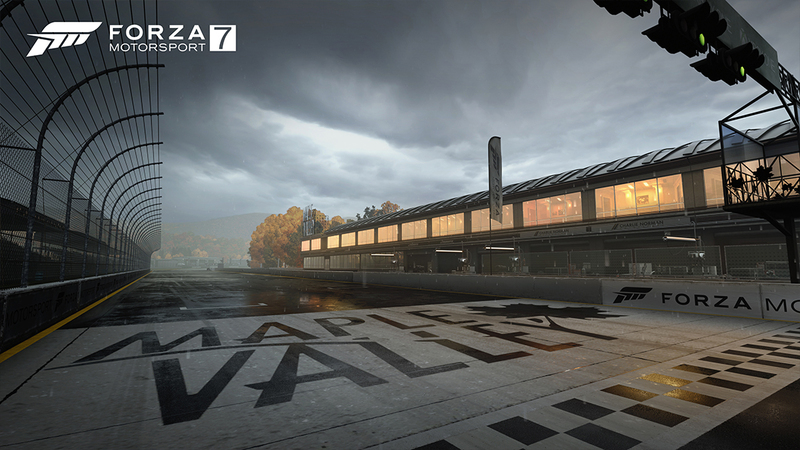 I might be wrong, but I could swear I heard an audible gasp of excitement on the Interwebz back at E3 when we confirmed that Maple Valley would be returning with Forza Motorsport 7. 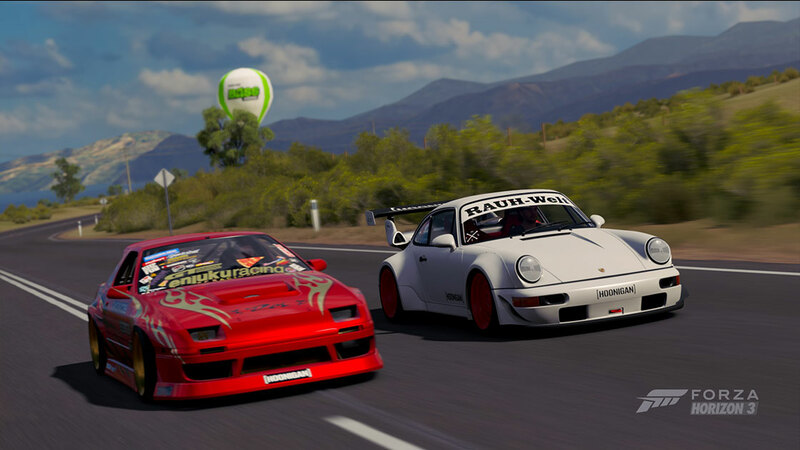 Is there a more lauded, more beloved track in the Forza universe? Whether you’re looking to test your sideways skills on one of Forza’s best drifting tracks, or you want to push the edges of speed on its sweeping corners, Maple Valley is a masterpiece in every respect. 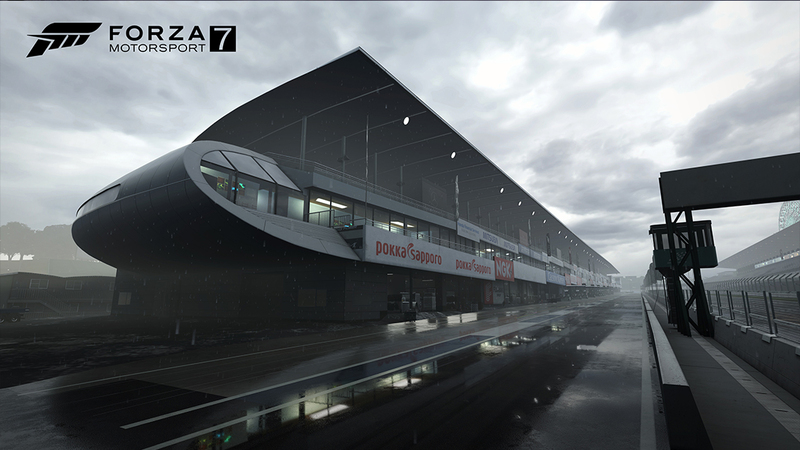 Like Suzuka, it will also feature wet weather conditions as well – also a first in Forza history. I want to make sure that you all understand what I mean when referring to conditions like weather and time of day. In Forza Motorsport 7, we’ve built tracks with a central goal in mind: Making every time you return to a track a unique experience. That goal manifests itself in a variety of ways. You see, there’s no such thing as a simple “rain” setting in Forza 7. Not for Sebring or the Nürburgring, or Brands Hatch, or any other track where wet conditions are available. Instead, the team has created a system that can smoothly transition through multiple weather conditions per track, and those conditions can (and often will) change throughout a race. You might start off with gray skies and fog on a track like Sebring, only to find yourself in the middle of a thunderstorm two laps later. The lights might go green at Silverstone during a light rain, only to find drivers in dry conditions by the end of Lap 2. As in the real world, conditions change and sometimes change quickly, and it’s up to drivers to react to those changes. Those dynamic conditions extend to time of day too. Turn 10 is building on the sky technology that was first seen in Forza Horizon 3, capturing real skies that bring life, motion, and color to every track in the game. 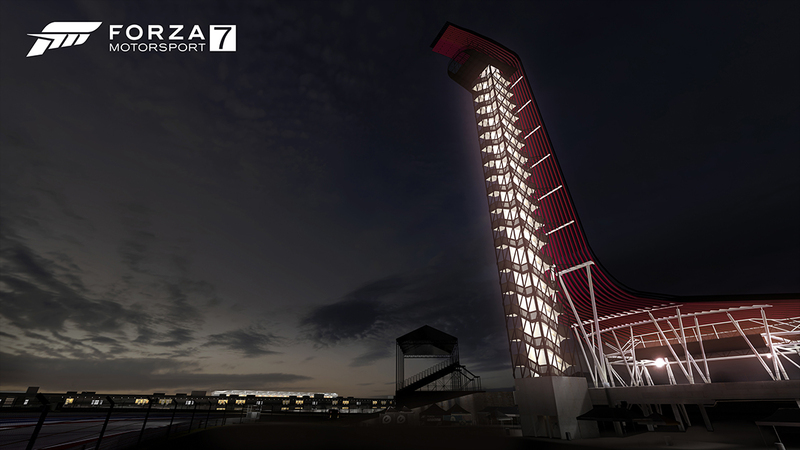 Check out the screenshot of the observation tower at the Circuit of the Americas against a darkening sky above – one glance is all it takes to recognize a Texas sky at dusk. 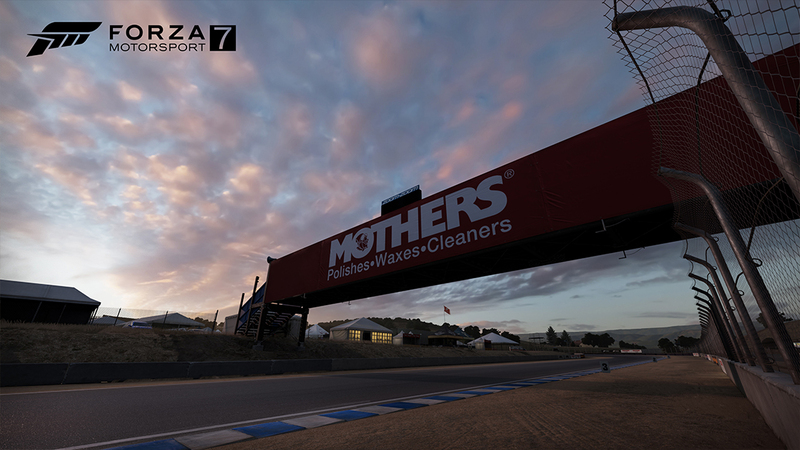 Even Laguna Seca (below) – a track that has been in Forza Motorsport since the very first game; a track that all of us have driven hundreds, if not thousands of laps on – feels completely new in Forza 7. Whether you’re talking time of day or the weather you’re driving in, it all comes back to that central goal I mentioned earlier: every race should feel unique. When you’re playing through the Forza Driver’s Cup single player campaign, you’ll experience that first-hand. Take a race at a track like Silverstone as an example. Maybe the first time you play it, you’ll battle the elements in a typical British downpour. Once the race is over, if you go back to play that exact same race in the campaign, your conditions may be completely different; in fact, you may not encounter rain at all. The team has introduced probability into the various race conditions scenarios; meaning that there is a percentage chance that the weather conditions might (or might not) change. One race, things will go from bad to worse; the next time around, conditions might stay in your favor. It’s that element of chance – and the need to prepare for whatever the race throws at you – that promises to make racing in Forza 7 so exciting. Weather and time of day are a game-changer in Forza Motorsport 7. It will add the kind of variety and challenge that was only hinted at in previous versions of the game. The unpredictable conditions you drive in will affect your race more than ever before, and all of it runs at the rock-solid 60 fps that Forza Motorsport fans expect. I can’t wait for all of you to see it in action for yourselves! Thanks Mechberg! Now, even though we have announced a whopping 551 cars so far, we aren’t even done yet. This week we unveiled the cars of Europe and beyond. You will find my personal favorite Volkswagen in there and regal marques such as Roll-Royce and Bentley and the most loved performance icons like Mercedes Benz, BMW, Aston Martin, Jaguar, and so much more. The cars of Europe speak to a distinctive level of quality that the continent’s car producers are known for. There are also car manufacturers found in this week’s announcement that you will only find in Europe like Citroen and Renault, or for that matter Australia, since the cars of Holden and HSV made their way into this list. Peruse Week 5 of the Forza Garage to find your favorites and get ready to fill your garage with this automotive finery when Forza Motorsport 7 drops October 3, or as early as September 28 if you buy the Ultimate edition with early access. This weekend in the world of #Forzathon, it’s time to go get what some refer to as “trophy mud.” Get in your favorite off-roader and get that thing dirty, then just let it dry to let the world know you had some fun. 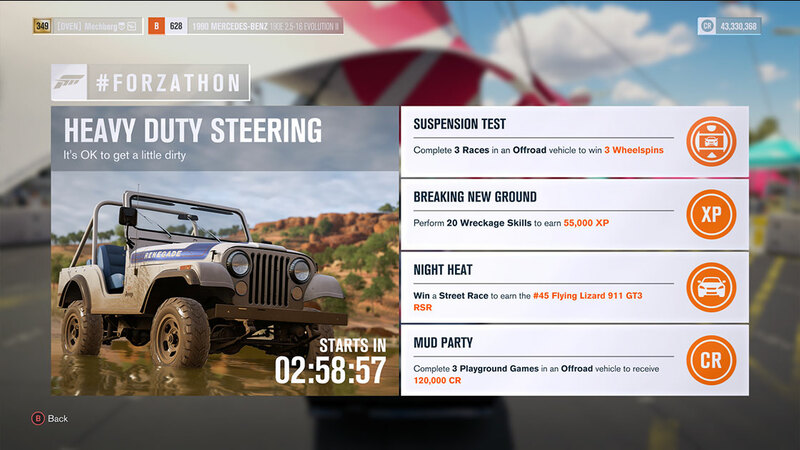 Go out and complete three races in an off road vehicle and win three wheel spins in “Suspension Test.” Trash some property in “Breaking New Ground” by performing 20 Wreckage Skills for an XP reward. After all, these rigs can take it. Looking to add to your race car garage? This week you can earn the #45 Flying Lizard 911 GT3 RSR by simply winning a Street Race in the “Night Heat” event. Then get dirty while earning an bucket of credits in “Mud Party” by simply completing three Playground Games. Have fun! Whether you picked up the Hoonigan Car Pack or not, you can go give Hert’s Twerkstallion RX-7 a beating in one of the toughest Bucket List Challenges to ever be offered. “A Hard Day’s Twerk” requires you to get 10 Lucky Escapes in less than four minutes. I found out how hard performing Lucky Escapes was last week on #ForzaFriday. Sure, my drift skills might not be in the upper echelon, but as of this writing only 34 players had completed the challenge out of more than 1,400 who tried it. You think you got what it takes? Have fun proving it in this tough challenge. If you can’t make it to Gamescom in Germany next week, fear not, you will find all the cool Forza Motorsport 7 features we are going to be talking about here on FM.net. As a teaser, I’ll tell you we will be talking about how car collecting works, but that won’t be all. Stay tuned for the details we know you are aching to read about. Tomorrow on #ForzaFriday is going to be my turn to drive the cars of the Hoonigan Car Pack. If you watched the livestream from the Hoonigan Garage you know I was too busy hosting and talking to get to drive any of the cars. Trust me, Friday they will never be the same so be sure to join us for what will inevitably involve a few trees and plenty of laughs.